Hetty’s Tea Shop is open six days a week, Tuesday – Sunday, and the trip boat will operate on Wednesdays, Saturdays and Sundays. Opened in July 2003, this newly built building was created to replace the original station building that had been demolished following the line''s original closure in 1965. Sit back, relax, and let our "Moorlander" dining train take you on a dining experience to rival no other aboard our dedicated First Class dining carriage "Diana". Tea rooms and cafés are able to maintain their own listings on this site. 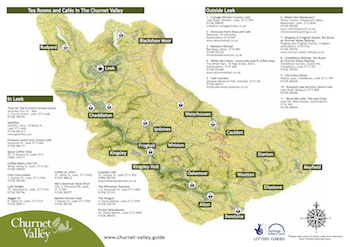 Register on the Churnet Valley Guide now. Support local food and drink providers. One of the great benefits of a healthy landscape is good local food. The Churnet Valley Living Landscape Partnership has supported local food producers and retailers. We are encouraging local shops, pubs and restaurants to use these high quality local products. Find out more about local food projects here.